Dr. Oscar Ellison enjoys spending time with his family. He also enjoys physical fitness, sailing, and reading. Dr. Oscar Ellison, III graduated from Harvard College and Georgetown University School of Medicine. His focus has always been on personalized medical care, wellness, and prevention. He has extensive experience treating hypertension, diabetes, and hyperlipidemia. 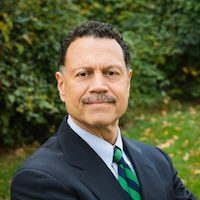 Dr. Ellison has served on numerous boards, including the Arlington Hospital Physicians Organization and the Arlington County Medical Society. He has also served as Vice Chair/Chairman of the Virginia Hospital Center Department of Family Practice. Dr. Ellison is experienced in Phase 3 Clinical Research and is the Medical Director of Atlantic Medical Associates. He has been awarded “Top Doctor” by Washingtonian Magazine, Northern Virginia Magazine, and Washington Checkbook Magazine. An accomplished athlete, Dr. Ellison competed in the Henley Royal Regatta and has won the Oxford triathlon.